dailydelicious: Chocolate and Meringue Semifreddo: Hand made, Home made Ice cream! Chocolate and Meringue Semifreddo: Hand made, Home made Ice cream! Sometimes, I don't believe that we really need a lot of kitchen gadgets (ice cream maker, food processor and etc.) to make something delicious ^^ but for anyone who love to collect them, it's different reason, haha (including me too). Semifreddo is a good choice for anyone who want to make an ice cream dessert at home without any help of ice cream maker, because you don't have to churn it. 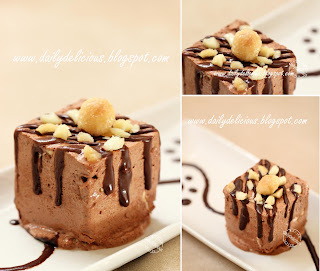 Semifreddo is very easy to make, it comes from two word "semi=half, freddo =cold", so the result is soft and airy kind of ice cream. The soft and airy quality come from the method of making it, unlike the ice cream that you will make a base and churn it in a machine (or by your hand ^^) to add the air into while cooling it. This one you will give the ice cream all the air that it needed before freezing by using whip cream (or eggs up to the recipe). 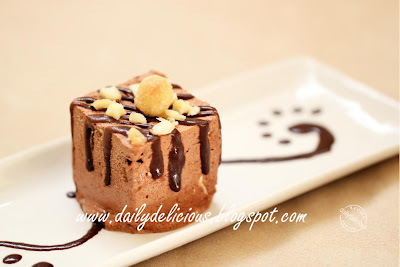 I like to make Semifreddo when I want to serve the ice cream quickly, because in order to make the good ice cream, I will need 1 day for making the base, chilling it completely, and churning it. 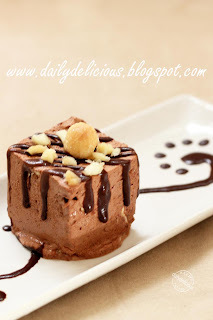 But for semifreddo I can make it before I go to bed (that's what I do, hehe), put it in the freezer, and it's ready to be enjoyed in the next morning. You can see how fast and easy it is. 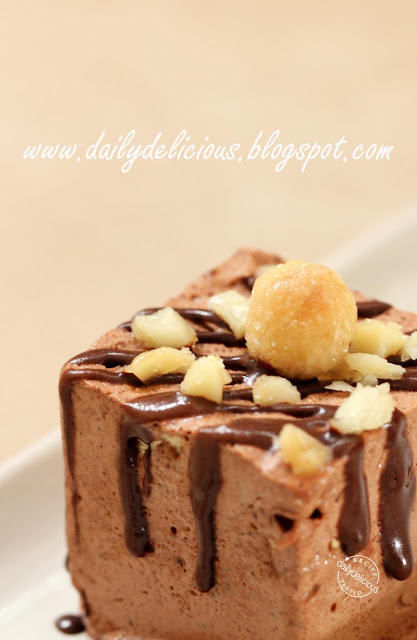 This recipe is an adaptation from ................... , the book that's really good for anyone who love chocolate (you can see inside of the book, ...........), no wonder that it contains a lot of chocolate too ^^. 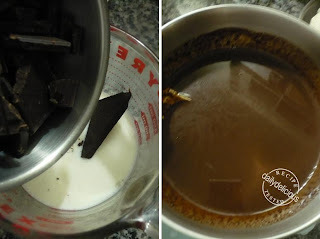 So if you want to make it just start now, Melting the chocolate, waiting for it to be cool, whipping the whipping cream, folding it together, freezing it and the next thing that you will do is having a great time enjoying it, and you know it needs only your hands to do all the job. If using silicone mold, you don't have to prepared anything, but if using metal tin, line it with baking paper. Heat the milk with sugar in the microwave until almost boil. 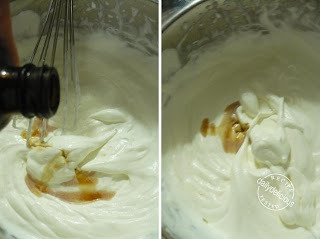 Whip the whipping cream with icing sugar until stiff. Whisk in vanilla extract and Crème de cacao . Fold 1/3 of the whipped cream into chocolate mixture. Fold the whipped cream and chocolate mixture back into the whipped cream until combine. 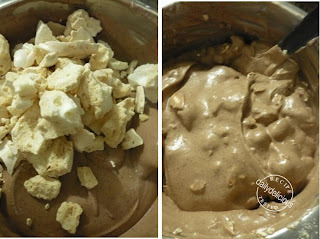 Fold in the crushed meringue and pour (or spoon) the mixture into the molds, and freeze for at least 4 hours, preferably over night. Serve with chocolate sauce (you can use Chocolate honey sauce), and some chopped nut, yummy! Wow! This looks really good for our hot weather now! I shall try this when I have the time. Yes, ^^ it's so refreshing ! Yes, you can use rum ^^.